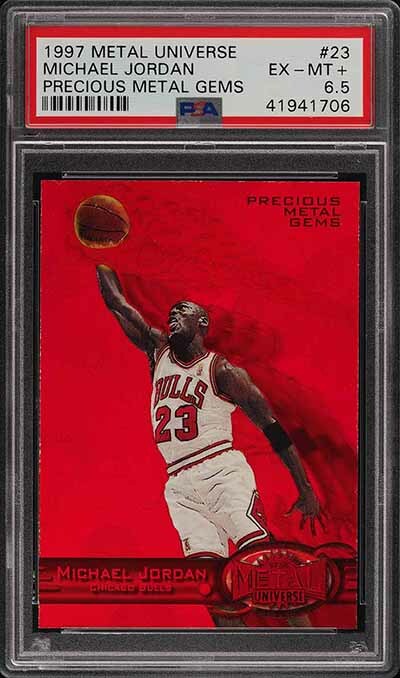 It wasn’t quite the $350,100 that the Green version got about a month earlier, but a 1997-98 Metal Universe Precious Metal Gems Red Michael Jordan still sold for a big number on eBay. A copy of the card closed at $63,100 on Wednesday, March 20. This particular copy comes graded EX-MT PSA 6.5. Eleven copies of the card have higher grades with PSA including four Mint 9s and six NM-MT 8s. BGS has 24 cards ranking 8 or higher including a pair of Gem Mint 9.5s and two Mint 9s. 1997-98 Metal Universe Precious Metal Gems are a landmark among parallels. No matter the player or condition, cards from the set get a lot of attention. The prices usually follow. The colors are bold and the foil edges often wreck havoc on condition. Besides Jordan, the set also has Tim Duncan from his rookie season, an early Kobe Bryant and lots of other players with big hobby followings. Each player has a total of 100 PMG parallels in the set. But those are split up into a couple of versions. The first ten copies are Green. The remaining 90 (serial number 011 and up) are the red versions. 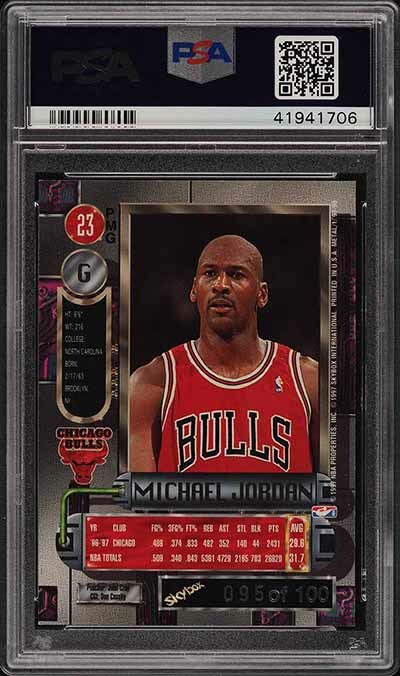 The 1997-98 Metal Universe PMG Red Michael Jordan from this sale is copy 095/100. The sale came through eBay consignor PWCC. Upper Deck and Basketball – Where Do They Go From Here? BGS Diary Predictor (May): What will Olds submit? Are there 1997-1998 Skybox Precious Metal NBA boxes still available to purchase? @Larry – I’m sure some have survived but I doubt there are many. If you go hunting, just be aware there’s a 1997-98 Metal Universe Championship Edition as well which is a totally different product. There are also PMG cards but not these ones.